Spring has sprung and what better way to celebrate than starting a new brewing project and make some flower beers! This will be the first in a series of flower beers made this spring / summer…hopefully they will all turn out well. This is the only one out of the four or five where I am buying the flowers to brew the beer. The remaining beers will be made with flowers from the garden or weeds in the case of the dandelion, spoiler alert. I like the idea of gruit beers but I’ve never made one. There is a lot of resources out there for people that want to make gruit beers. One of the best websites for the production of gruit beers is probably gruitale.com. I considered making this beer a gruit but ultimately added one ounce of hops due to my own brewing tradition, also as it turns out you have to add some hops to wort in the United States to be able to legally call a beverage a beer. This restriction doesn’t apply to homebrewer but I find that legal fact interesting none-the-less. I love the idea of using flower though (other than hop flowers) and hope to be brave enough to try it this year. The first two of these flower beers will have hops in them though. Hibiscus is the first flower beer to be attempted this year (followed by a dandelion beer made with flowers from the yard and surrounding areas). I have no experience brewing with hibiscus but I have had beers that use hibiscus. Hibiscus is reported to help with high blood pressure and a few other maladies, I cannot speak to its efficacy, but at least it is considered a normal food product. I ordered some dried hibiscus flowers online and read a few homebrew recipes (but didn’t try the beers). I ultimately decided to use 2 ounces at the end of the boil (about 10 minutes out) to start. Last year I made a dandelion beer that used about 2 ounces of flowers and it did make it through but the flavors were subtle. That dandelion beer had Brett c in it as well so I decided that this one would too. The flowers (pictured above) were just the petals and were dehydrated and quite brittle. I selected two ounces of intact petals rather than the powder that was in the bottom of the bag. There are more and more hibiscus beers available but I decided not to review any for this post, they are generally draft beer and a little hard to come by. If anyone knows of a bottle (or canned) version of a GOOD beer that showcases hibiscus flower, let me know in the comments and I’ll attempt to get one. Grain was mashed at 156 F for 70 minutes in 5 gallons of water. Sparge was done with an additional 5 gallons of water. Just over 9 gallons was recovered. Wort was brought to a boil quickly and the boil lasted about 75 minutes (pretty typical for a bigger beer on my system). Only one ounce of Czech saaz was added at 60 minutes, 2 ounces of the flowers were added at 10 minutes, the wort immediately turned bright pink. The extraction of the color from the flowers was near instantaneous. Dark ruby pink drops fell out of the hop bag when I pulled it out. I decided to leave the bag in for the chilling to extract as much as possilbe. Wort was chilled with an immersion chiller for 40 minutes and transferred by pouring into a glass carboy. Beer was fermented with the house strain plus two bottles of dregs from the Brettanomyces clausseni Ale. Fermentation took off after a few days, the color of the beer in the fermenter sort of looked like strawberries and got lighter in the first few days of fermentation. Befofe the krausen fell I added the two bottles of Brettanomyces clausseni Ale just to dose the beer with some new Brett…for added character. The higher mash temp and these bottles should boost the Brett character, hopefully it plays well with the flower. This beer is a little bigger (high in alcohol) than I have been brewing lately. I decided to do this because this was going to be bottled and I wouldn’t feel pressure to drink a ton of it, as I would if it were on draft. I’m pretty pleased overall with how this brewing and bottling shaped up. This beer is bottle conditioned and was primed to just under 3 volumes of CO2. I took about a month for the carbonation to come up to what I now hope is the terminal amount. It occurs to me that I’ve drank beers made with hibiscus… but I don’t think I could tell you what hibiscus tastes like. 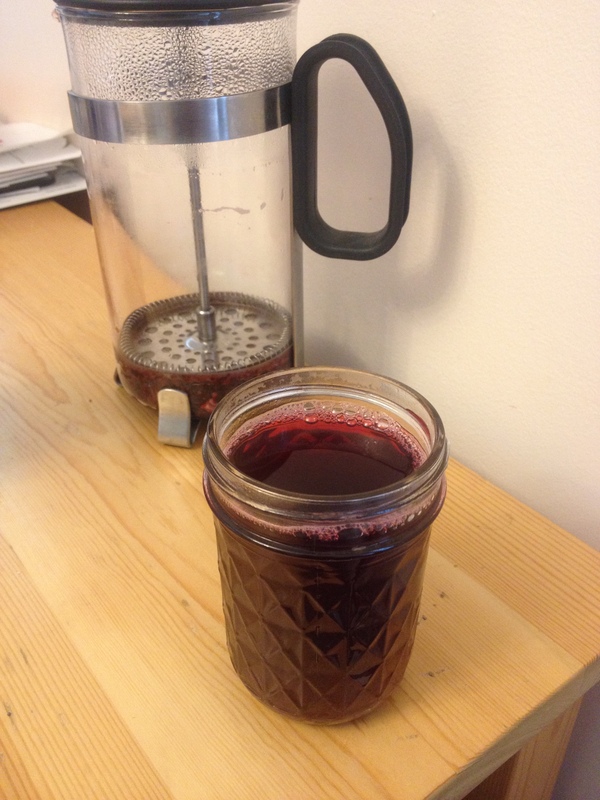 Short of popping one of the dehydrated petals in my mouth and telling you…I thought it would be better to just make a small amount of hibiscus tea and see what is what. Sorry for the diversion but I can’t think of a better way to do this. Bring water to a light boil, pour into French press with the hibiscus flowers in the bottom. Allow 15 minutes to steep and press the pedals out of solution. Add honey and lemon juice to the mixture and serve over ice or hot. I decided to drink the tea hot. It is incredibly dark ruby red and clear otherwise. There is a rose-like aroma to the beverage, it smells sweet but not from the honey I added. It is a little bitter, floral, sweet, the citrus from the lemon cuts through pretty quickly, might even be dominant in there. I can definitely taste the flowers. There is a sort of grassiness to them with this nice almost rosewater quality. Pretty interesting. There is a growing resinous quality to the flower the more I drink. Citrus is the right flavor to pair with this flower I think. Beer is pinkish and mildly hazy with a nice frothy white head of small bubbles, great retention, tons of lacing on the glass. The carbonation on this beer is incredible. If you’ve been kegging very long…please tell me how to get a kegged beer have this much steady and consistent carbonation. I would give the look of this beer a near perfect score. It is beautiful. I guess it could be redder but it looks amazing. Aroma is pretty sweet with this nice Brett c character popping through pretty easily. There is a mild sulfur smell to this beer as well. Beer is light and effervescnet on the palate. It is thin but doesn’t finish too dry. The mild funk / fruitiness from the Brett c is the star of the beer, it is really nice. There is a slightly floral / rose waterish flavor to the beer that I’m interpreting as the hibiscus. It is not as sweet or as fragrant as the tea but I can sort of taste the flowers…just not enough added I think. At least double it up in the next attempt at this. Overall, for a 7% beer, this is crushable. If you like Brett c, you’ll love this beer. Seriously. It is quite good. Just in time for the summer here. I will easily be drinking one of these several times a week until they are gone. I guess more hibiscus is where I’d start. 2 ounces wasn’t enough for the flavor to really shine. The overall beer is good and I like the color…maybe clarifying a little more would also help, make the pink more obvious. If I remake this beer there will be at least twice as much hibiscus in it, that’s a promise. I think a Brett b version of this beer would also be interesting…get more of the grassy / earthy / leather / horse blanket character in there. Since the tea tasted so good combining the citrus flavors in there I think this would be a good flavor to incorporate into the beer as well. Maybe including some zest in the next one would help the flower flavor pop a little more. 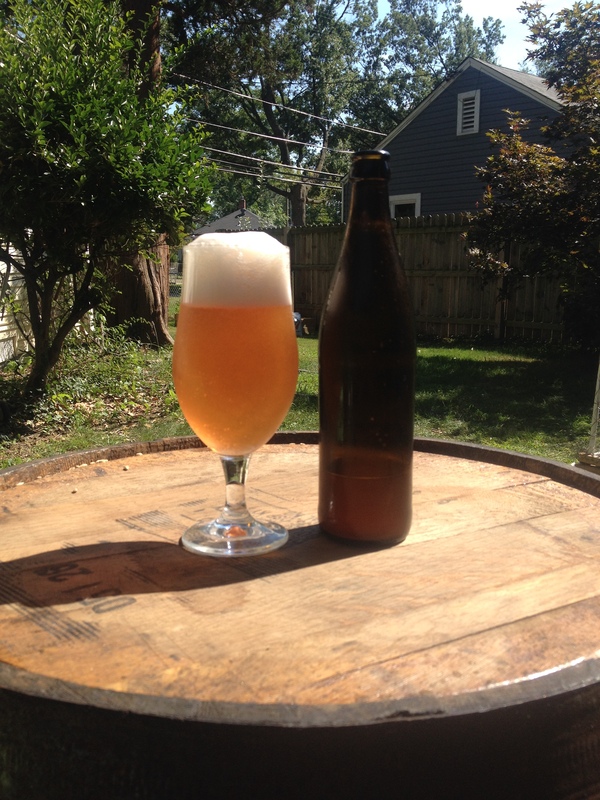 Look for a post on the other flower beer that is currently in bottles conditioning, a Dandelion Brett saison. That beer was made with 10% honey malt in the grist. Additional upcoming beers are more experimental hop saisons, two left in this year’s series. There area few Galaxy saisons coming out and I’m working on a few different grains as well (naked golden oats and acidulated malt)….so look forward to those. Great blog and great post! The first beer that I used brett on was almost identical to this with brett c, wheat and all. I loved that beer but never brewed it again. This post may be the motivation I needed! Thanks! I do enjoy this beer. You should definitely rebrew your beer. How much hibiscus did you use (if you remember)? Oh man, I’m pretty sure it was 6 oz., and also at 10 min. I remember it being pretty pronounced and thinking I should dial it back a bit. If I were to do it again I’d use 4 oz. Color was crazy though, deep red and a pink tinted head. Ha, we bookened the hibiscus then. When I rebrew this I was planning on using 4 ounces. Glad to hear the other side of it. Previous Previous post: Beer Pedantry #1: What is “lambic”?